I love my friends. Honestly. So diverse. The different conversations. My friend, James, was the inspiration for this post, as he bought up some topics which stirred up a lot of passion for the both of us. It first started after we began conversing about the controversy surrounding Nicki Minaj and her recent rant regarding the disregard for her music video in the VMA nominations. It really annoyed me that, out of all the award ceremonies to demand respect from, the uproar started from the VMAs, a bunch of bull, video music awards! Really? A VMA has now become a milestone in an artist’s career? The award shouldn’t even go to the artist it should go to the producer/director of the video. Sorry let me just calm down. Never the less, the message Nicki was trying to deliver is, I believe valid, she noted that ‘Anaconda’ had been overlooked because of her image. Her race, her body, etc. As much as I, personally, couldn’t care for the video, Nicki had the right to believe her vid was iconic and left a stamp on every form of media communication. Even enough for internationally recognised chat show host, Ellen, to create a spoof of the video. In fact if you were to ask me what happened in Taylor Swift’s video, I couldn’t tell you. You hear “My Anaconda don’t…” and the imagery of Nicki and her backing dancers twerking rushes your visuals. Now, I’m the first person to detest a person who relies on the overused victim black card. This is not to say that I am ignorant to the prejudice which still exists today. This is not to say I have never fallen victim to someone’s racist beliefs. This is not to say that I am unaware that the melanin in my skin leaves some believing that we are beneath them. That’s nice for them. Seriously. This is the doing of society. The white man in the suit is deemed to be more superior than the black man in the suit, whether academically, financially, etc. It is even done sub-consciously, it is that instilled, it comes naturally, a result of their environment whilst living out their childhood. I didn’t get the job because I’m… black but I will ace the next interview to prove to that employer that I’m worth something. I don’t feel as though Nicki is using the black card but attempting to raise awareness. Nicki has a diverse group of fans, meaning that her message is reaching those who were initially unaware of any struggle, as we cannot lie, a lot of people are ignorant to a cause they have never been affected by. I’ve seen this first hand when my partner in crime, Julienne, posted a video relating to the wrongful abuse of a black man by a Caucasian police officer. To an extent I agreed with him, we couldn’t see the build up but I had to stop him there. If there were no evidence and truth to the stories which are very familiar to this one then viewers would not be so quick to believe and take as Gospel. I even went as far as to tell him he needed to get out of his bubble in his happy go lucky village. Not because you have never experienced something does it mean it does not exist. I’ve never experienced a hurricane, a tsunami or an earthquake, does that mean they are not real? More to the point I feel as though a revolution is on the horizon. I just worry it will fall on deaf ears as we have failed to educate the younger generation enough for them to know how to communicate their frustrations successfully. In fact, with the new generation it’s no longer a race war, but more of a class war. 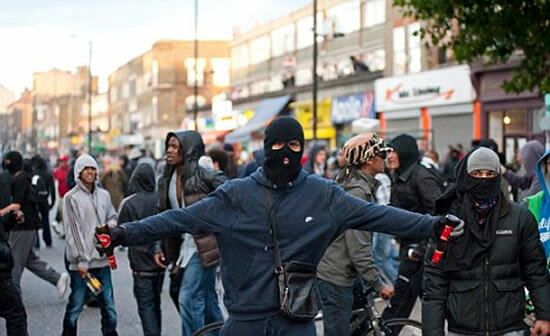 I feel as though the young generation no long fall into black and white culture but more of a new found young British culture, which is more United in terms of race but divided by class (an example being the London riots). Society needs to catch up.